It’s hard to imagine a job more soul-crushing than serving as Donald Trump’s press secretary. All the contradictions, lies, and aggressions of this administration are brought down to bear on this figurehead, who must then attempt to reshape reality itself into a new cosmos in which Trump’s race-baiting, apocalyptic policies, threats, and general sense of dementia are not just normal but virtuous. Assuming the mantle from Sean Spicer, who seemed to be going quietly insane during his tenure in the post, Sarah Huckabee Sanders has maintained a steady demeanor in the role, even though she’s been forced to call Trump’s comments about police abusing gang suspects “jokes,” not to mention weathering the whole Picklegate thing. In short, she is doing what she can to make her boss pleased, which is pretty much all anyone in this administration is trying to do. Last Friday, Sanders signed off on her personal Twitter account to take over the @PressSec account, and has in short order remade it in a most Trump-pleasing way: Of the 73 accounts she follows, only one is a “journalist” (read: pundit) and you will not believe who it is. 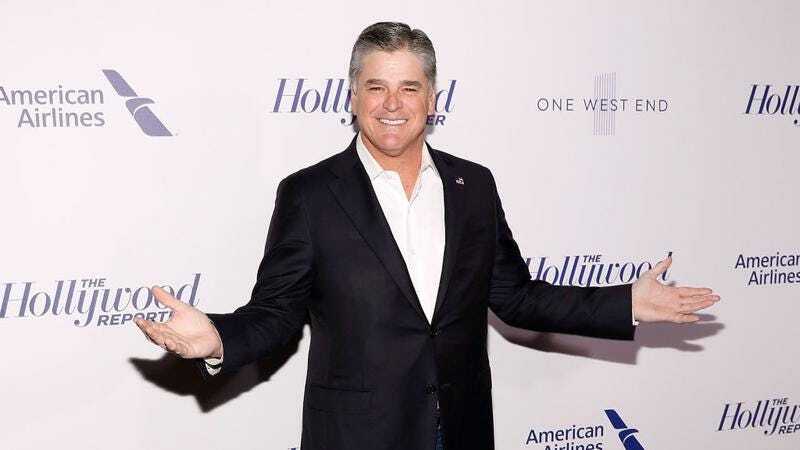 Okay, you will: Sean Motherfucking Hannity, as The Daily Dot points out. Yes, the strong-chinned blowhard and Last Man Standing of the old Fox News ruling class, now that the rest have been run out on sexual assault allegations, is the only person in the media this press secretary needs updates from. Aside from that, she follows a handful of official government accounts, all of the Trump children, a few news networks, and the expected cabinet members and insiders like Kellyanne Conway. And Sean Hannity, who knowingly helped propagate the conspiracy theory that Hillary Clinton’s campaign had an ex-staffer murdered, among other crimes. If you’re going to assume the position of defending Trump’s policies and statements, you might as well start by mimicking his media diet.